WASHINGTON — Nearly two years after unveiling its initial plans for redevelopment of the RFK Stadium site, Events DC divulged its latest update for the first phase of that process Wednesday. The new plans, revealed at St. Luke Catholic Church in Southeast D.C., include an expansion from two to three fields stretching along the Anacostia River on the north side of the site. 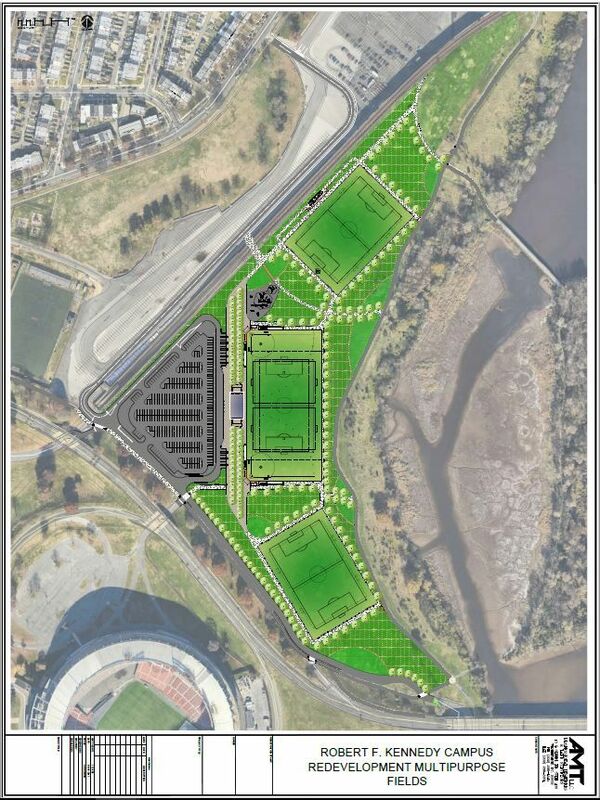 There are two planned full-size soccer fields surrounding a multisport field equipped for soccer, lacrosse and baseball. The modifications also include an access road connecting to Oklahoma Avenue to the north, as well as a celebration pavilion as something of an anchor structure for spectators and events before and after games. There will be a playground between the multipurpose field and the soccer field on the north end, as well as park space on each of the far tips of the boomerang-shaped green area. Events DC President and CEO Greg O’Dell presided over Wednesday night’s meeting, the latest in a long process that he hopes is getting close to moving from concept to actualization. There are still legal hoops to jump through via the federal and local regulatory process, but construction will not involve any deep digging, which should help keep those hurdles manageable. The hope is to start construction in the late summer or early fall of this year. “If we get late summer or fall to construction, we think in the spring of 2019 we’ll actually have some fields there and we’ll see lots of kids and lots of activity. So, that’s what we’re shooting for,” O’Dell said. The other four aspects of the project include a market hall, a sports and recreation complex, pedestrian bridges to connect the site to Kingman and Heritage islands and the east side of the river, and a lasting memorial to Robert F. Kennedy. Events DC is still in the concept phase for the memorial, as it looks for a plan that is financially sustainable. The organization has been working with the Kennedy family to ensure the memorial suits his legacy. In the meantime, O’Dell said they are looking for potential partners for the market hall and sports and recreation complex, which are on target for use in 2020 or 2021. And although the proposed “Amazon HQ2” site would be on adjoining land, it would not interfere in any way with the RFK plans, according to O’Dell.